CHICAGO — Software as a Service vendor Workday announced new machine learning capabilities and a new analytics solution for its human capital management (HCM) and financial products at its Workday Rising conference on Tuesday. Workday Prism Analytics becomes more widely available to customers, the outcome of the Pleasanton, Calif.-based firm’s acquisition of Platfora. The new solution allows customers to pool together data from Workday and other sources to analyze with a suite of tools and algorithms, and visualize them to aid in making business decisions. Started in 2005, Workday has since grown to more than 1,800 customers of its flagship HCM product. A more recently introduced financial product line has also attracted more than 370 customers. The firm counts many Canadian customers, including Hootsuite, Sun Life Financial, SNC-Lavalin, and Aldo. Behind the new Prism Analytics software is an architecture that uses a Hadoop database with containers. The in-memory architecture allows realtime crunching of large data sets into business insights. This is possible even if the data is being ported in from outside of Workday datasets. Prism Analytics is a separate product that has to be bought in addition to other Workday subscriptions, though it integrates throughout the user interface. Pricing for the solution is based on how much data is uploaded for analysis. 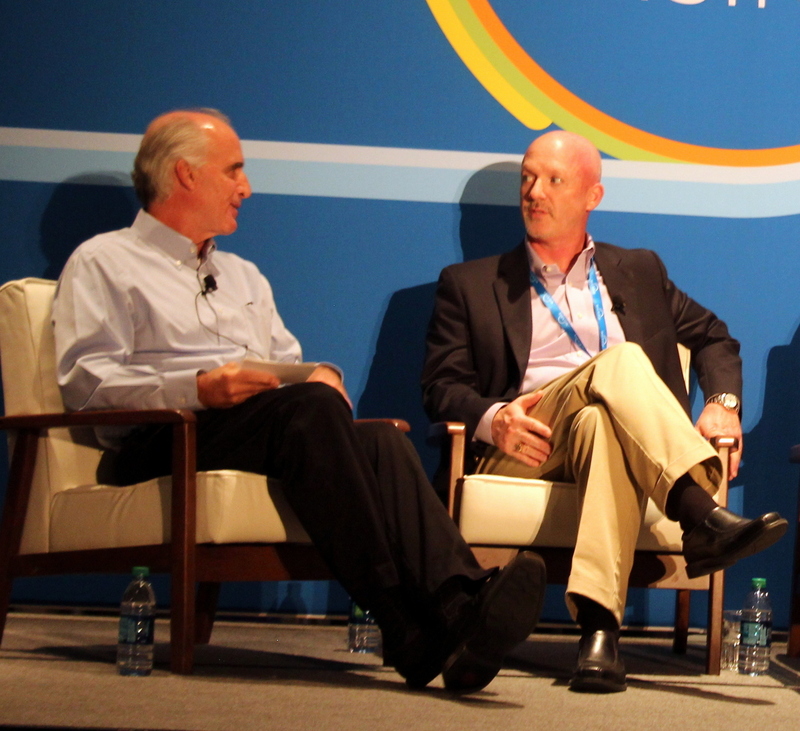 Workday’s co-founders on stage at Workday Rising in Chicago. But Workday customers should be able to afford it, if the stock portfolio of Dave Duffield, co-founder and chairman of Workday, is any indication. 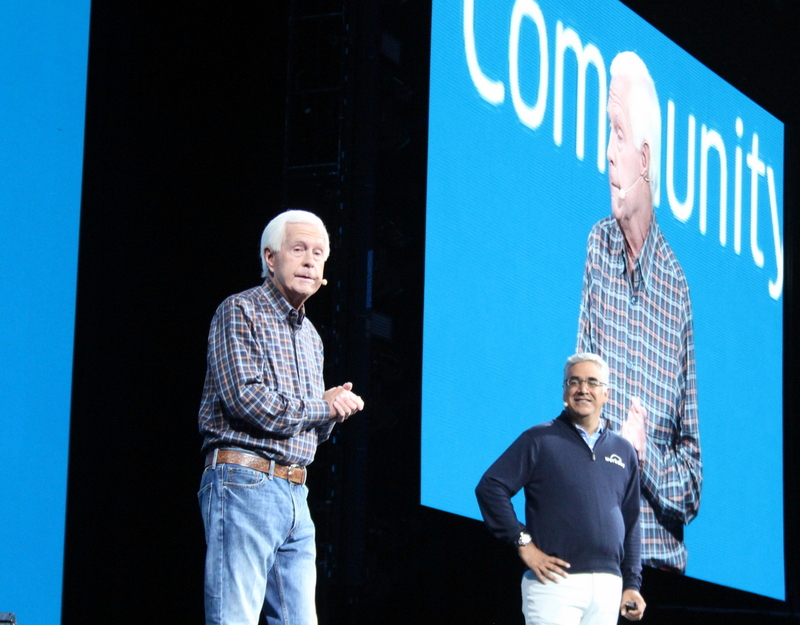 On stage at the opening keynote, he shared that he has invested in 598 customers of Workday. Since 2007, those customers are up 76 per cent, compared to the Dow’s rise of 46 per cent. Now Workday is looking to upsell that customer base on the new software it’s selling to the market, including financial planning, management, analytics and HCM. All of them offered as cloud services, says Aneel Bhusri, co-founder and CEO of Workday. Workday was the right choice for restaurant chain Denny’s, says its Chief Accounting Officer Jay Gilmore. Adopting the HCM solution in January, and following with the Finacial solution in August, so far the experience has been a grand slam. Denny’s finds value in having a unified platform across its lines of business, says its Chief Accounting Officer Jay Gilmore (right). Denny’s felt having a unified platform for its business units was important. When it went down the path of exploring those options with some vendors, it found that what was often presented as a unified front was more often an assembly of acquisitions. “We frequently asked the question ‘are they all part of one platform’ and the answer was ‘not exactly,'” he says. That platform advantage has Denny’s considering Prism Analytics for its next Workday deployment, Gilmore says. Workday’s best performance and capability compared to competitors is on the HCM side, says Holger Mueller, a senior analyst at Constellation Research. With its most recent release of the cloud software – Workday 29 – it exposes machine learning to more functions, indicating it could be a differentiator in the future. But before it’s able to do that, it will have to forge a partnership with a hyperscale public cloud provider. That would allow them to bring all their customer data together to provide more in-depth machine learning, across different features. Prism Analytics is expected to be released to general availability in the second half of 2018.